Forget silly little discoveries like the Internet and penicillin because these are nothing in comparison to arguably one of the best things in the entire world; hot sauce. Not only do you see nothing wrong with spending a small fortune on the spicy stuff, but your nearest and dearest know that you aren’t even exaggerating when you proclaim that you can’t live without it. Sound familiar? Then you’re most definitely addicted to hot sauce. Despite your existing impressive collection of hot sauces, you still weep with tears of pure joy every time you discover something brand new. It’s physically impossible for you to choose a clear favourite. It’s a bit like asking parents to choose which child is their favourite; it’s just not realistic. 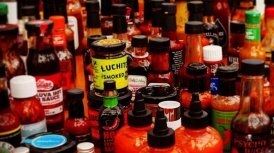 85% of food that you consume is painfully bland, and you only consider food to be edible if it contains at least three different types of hot sauce. Yummy. 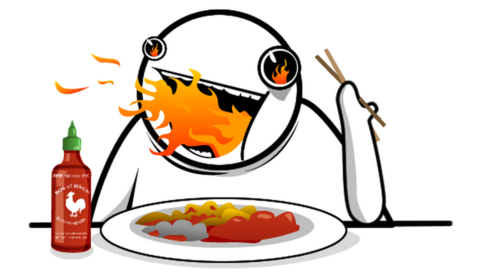 The only downside to your obsession with all things spicy is that you are quite prone to heartburn at least twice a week. But you don’t let this stop you, and instead you take necessary precautions by carrying Gaviscon with you at all times. You like to think that you’re prepared for whatever bland food that life can throw at you, hence why you carry a small supply of some good all rounder spicy sauces around with you at all times. You never know when you may encounter a food emergency. At least once you’ve accidentally rubbed your eyes whilst forgetting that you have some delicious hot sauce on your fingers. Ouch. Everyone always brings up that one time you ordered food for your nan and it was so spicy that she contemplated going to A&E because she was convinced that her taste buds were permanently damaged. You still maintain to this day that it wasn’t even that spicy. Anything that carries a food warning is interpreted as a challenge that you must undertake immediately. For the record, nothing can ever be too spicy for you. It is just physically impossible. You won’t let a bit of snot, sweat or runny eyes stop you from enjoying the spicier things in life, hence why you ensure that you’ve always got a pocket pack of tissues within reaching distance at all times. You don’t believe in adding a few drops of hot sauce to your meal. No, not at all, and instead you opt for the drowning approach. Zingy. You don’t trust the staff canteen to be able to sufficiently cater to your spicy desires, hence why you keep a minimum of two bottles hidden in the bottom of your desk. As soon as you discover someone you vaguely know enjoys hot sauce you automatically upgrade them to best friend status, and start planning hot sauce related trips together. The obsession doesn’t end with just hot sauce. You’re also a fan of chilli chutneys, chillies, spicy peanuts, and obvs chilli chocolate. You await the arrival of your hot sauce box every month with more excitement than you would for your first child. Seriously, what are you waiting for? Sign Up NOW!